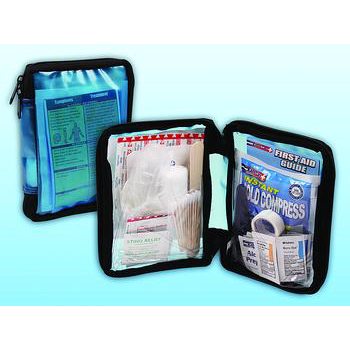 First Aid Kit contains 67 pieces in an organized, blue nylon soft pack. Designed to be used for common injuries; cuts, sprains, minor burns, insect bites, or splinters. Rapid Care First Aid Kit 67 Pieces, Soft Pack - 1 Kit. Contains 67 pieces in an organized, blue nylon soft pack. Designed to be used for common injuries; cuts, sprains, minor burns, insect bites, or splinters.